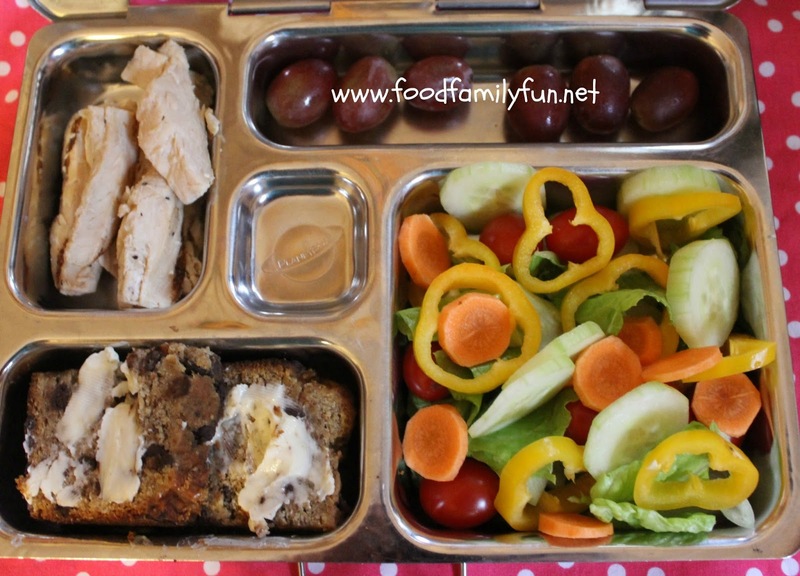 Yesterday, I posted one of Rose's favourite kinds of lunch - the snack box. Today her Planetbox has her second favourite kind of lunch - salad. Rose has Applegate Farms chicken strips, red grapes, dairy & gluten free choc chip banana bread (recipe from Natural Nutrition) with probably a bit too large of a smear of dairy free butter like spread! The main compartment has all of her favourite veggies in a salad - romaine lettuce, grape tomatoes, yellow mini bell pepper, carrot coins & cucumber. When she came home she said it was the best lunch ever, even the chicken. Love her. We had two very scary storms here in Bermuda. First Tropical Storm Fay and then a week later Hurricane Gonzalo. I am happy to report that we are all fine and have power restored at our home. 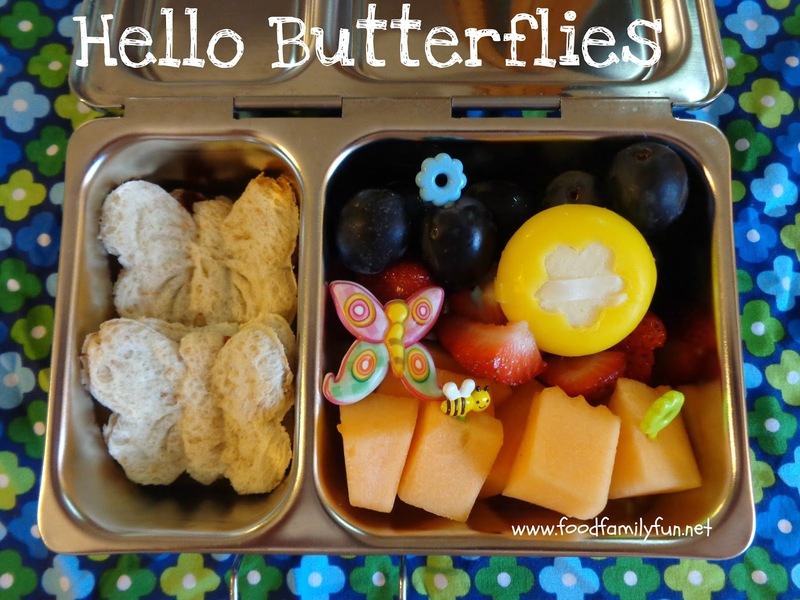 Here is a today's lunch for Heidi packed in one of our new Yumbox Panino containers. 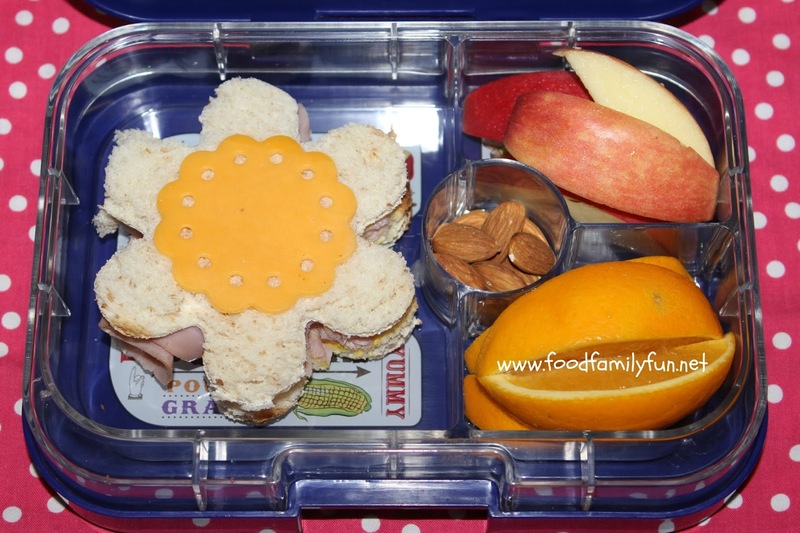 Ham sandwich with cheddar cheese topper, apple slices, orange slices & almonds. I'm sure that it will come home empty - hers always does! We are celebrating the birth of Shel Silverstein, he would have been 84 today. I remember when my Mom first gave me A Light in the Attic and Where the Sidewalk Ends, I instantly read them cover to cover. The poems made me chuckle and I loved the drawings. Right before school started in September, I bought A light in the Attic for my 8 year old. She enjoyed it just as much as her Mom and has read loads of poems aloud to her sisters. 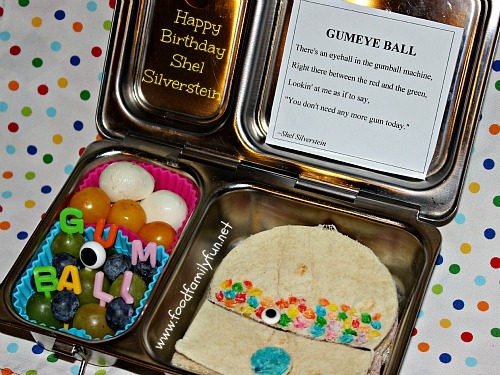 Today's post is part of a blog hop with my Bento Bloggers and Friends in honour of Shel Silverstein's birthday. Welcome to any new readers! To hop along to the next lunch in the hop, click the button at the end of the post. This short poem from A Light in the Attic, gave us all a giggle and inspired today's lunch. Rose's lunch is a cheese sandwich with a tortilla gumball machine topper. yellow tomatoes and fresh mozzarella cheese, grapes and blueberries. 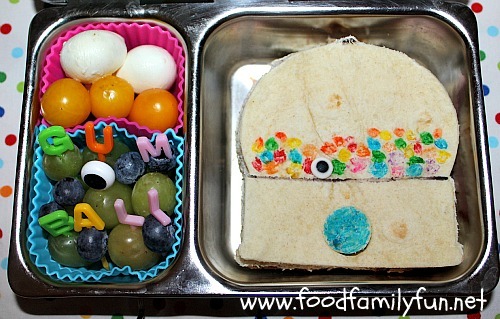 For more fun Shel Silverstein themed lunches click the button to hop over to Lunches Fit For a Kid and see what Astrid has made. I bet it's fab! Yesterday was Emily's first day at school! She handled it like a champ. No tears and enjoyed her day at big school. She will be at home by lunchtime each day this year so I won't be packing her a lunch to take. 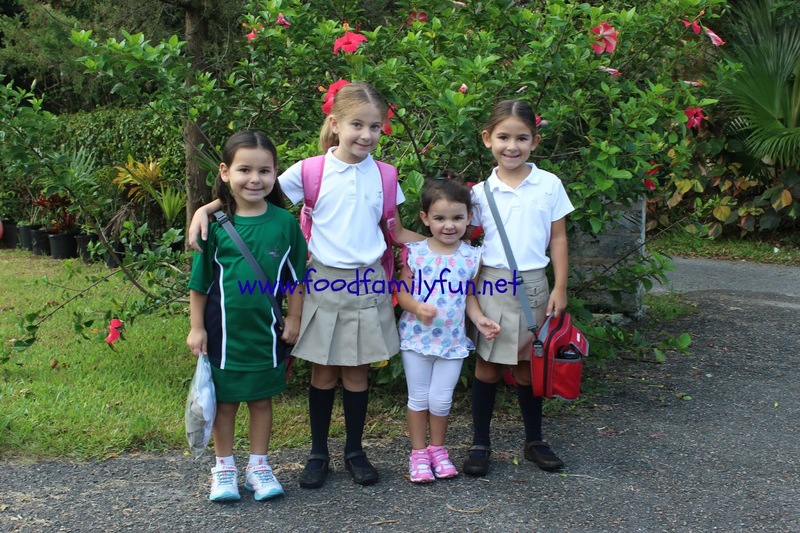 Here are all of my girls ready for school yesterday. They were greeted by a bunch of smiling teachers who have known most of them since they were babies, happy to have all of them at school together at last! It was quite a moment for me to have them all climb out of the car and head off to their classrooms. Of course, I spent the morning thinking of them, particularly Emily on her first day, hoping that it was a good one! And it was. Poor Rosie did not have a good day, I had to pick her up after lunch as she was not feeling well. Fever & a sore throat - we're off to the Dr today. Yikes! 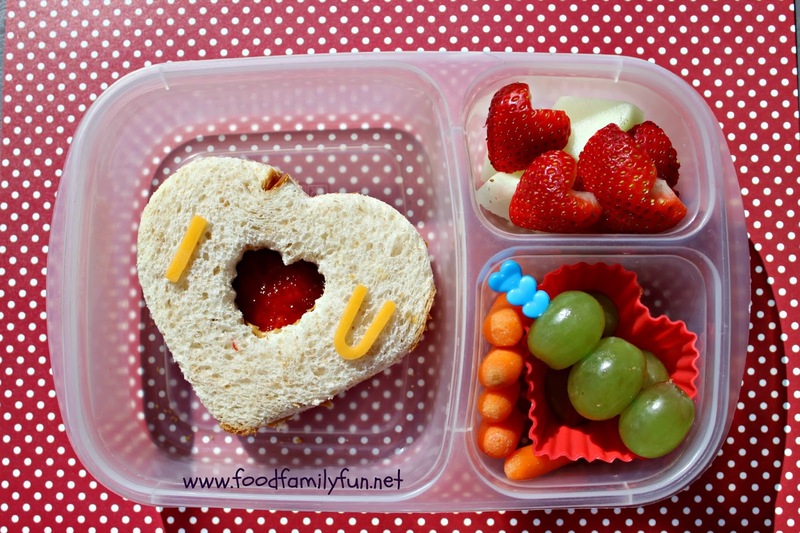 The girls wanted a little yogurt in their lunches today so I used our leakprook Yumbox lunchboxes. This was Rose's lunch - she didn't eat much on account of not being well. 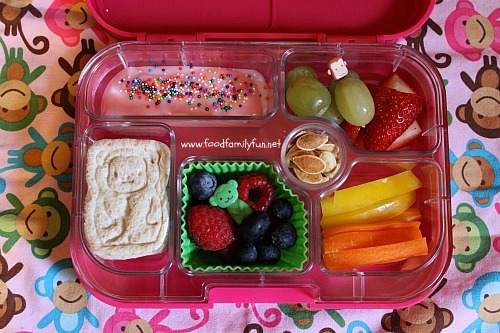 yogurt, cheese sticks, sprinkles in the little cup for her yogurt, no bake energy bites, pepitas, grapes & strawberries, grape tomatoes, yellow bell pepper. Just realised that I put her eye picks in with the eyelashes facing the wrong way - oops! 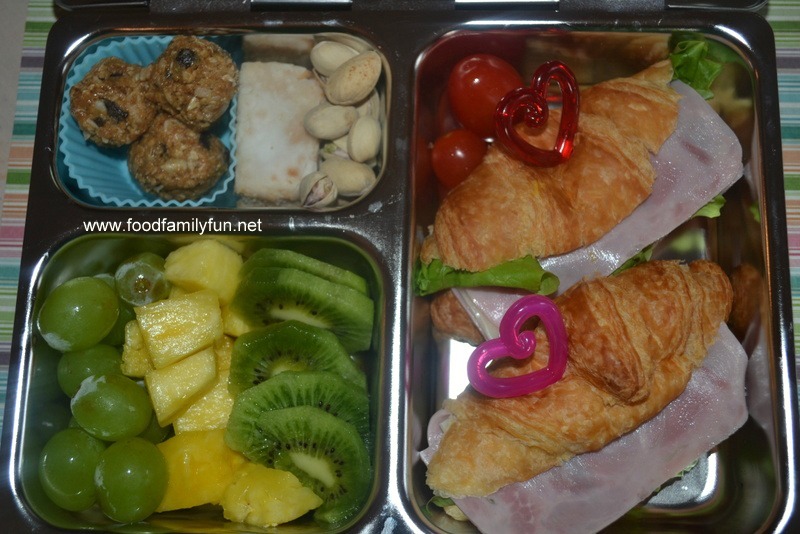 Amy's lunch is packed in our brand new Yumbox Panino. Sadly, this photo is pretty terrible. I was a bit nervous for Emily's first day and trying to get out the door early enough in case she had a meltdown at dropoff. My hand must have been shaking! Today is back to school for 3 of my 4 girls. Emily won't start until tomorrow. 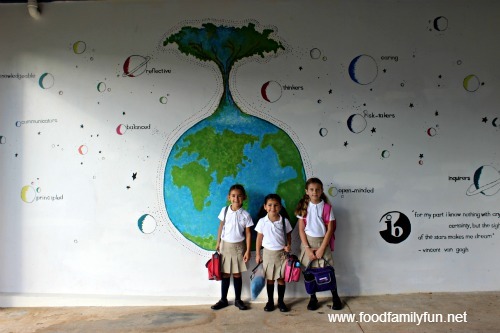 Here are Rose - P2, Heidi - P1, & Amy - P4 at school this morning. 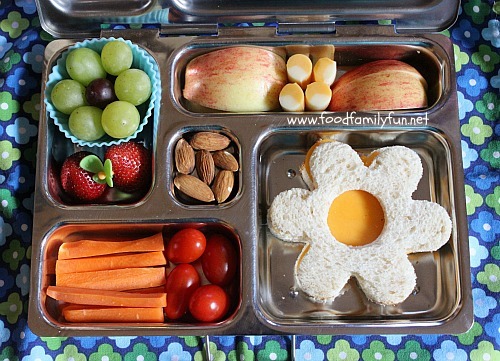 First day of school lunches all have a flower theme. Don't you love that little grapes flower? I got the flower ideas from BentOnBetterLunches. Amy's lunch is packed in the Planetbox Shuttle. It's one of her favourite containers. 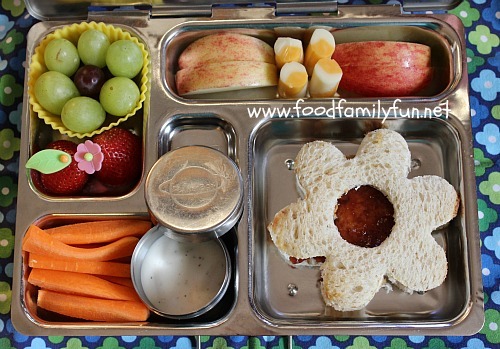 2 flower shaped ham sandwiches, grapes, strawberries, carrot sticks & cucumber rounds. I always get a little bit nervous on their first day of anything - school, camp, a new activity. They all were happy to get back and see all of their friends and go to their new classrooms. Meanwhile, I have a few butterflies. I hope they are all having a fabulous first day back at school. I can't wait to hear about it at pickup. Seriously, no one wants to open (or store) a bunch of different containers and their lids. No one wants to spend their precious morning time assembling the lunchbox puzzle with said containers to make them fit the lunchbag, all the while crossing your fingers that your kids can repack it all after lunch. Especially if you have more than one lunch to pack. 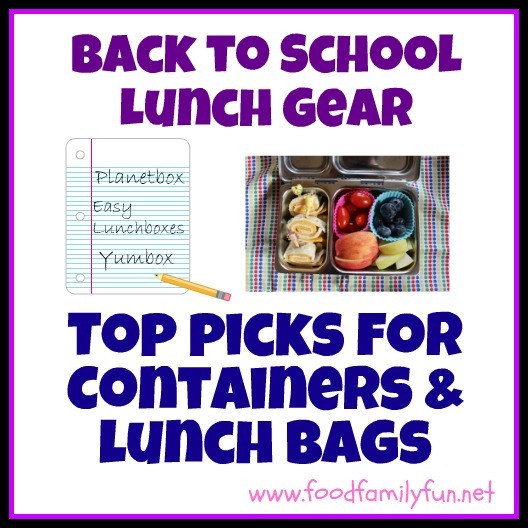 These are my top picks for practical lunch containers that will not leave you frustrated. They will also save you time! These are family favourites, the lid is attached, the compartments are divided, there are small dip/yogurt/applesauce sized containers that fit inside and seal shut without leaking, they are easy to open and close. Plus stainless steel is a breeze to clean (even if accidentally left in the car over the weekend - not that it has ever happened ;) ) Local friends in Bermuda - you can also purchase these locally at People's Pharmacy. Although I have had several requests, I am not organising a group order before school starts. 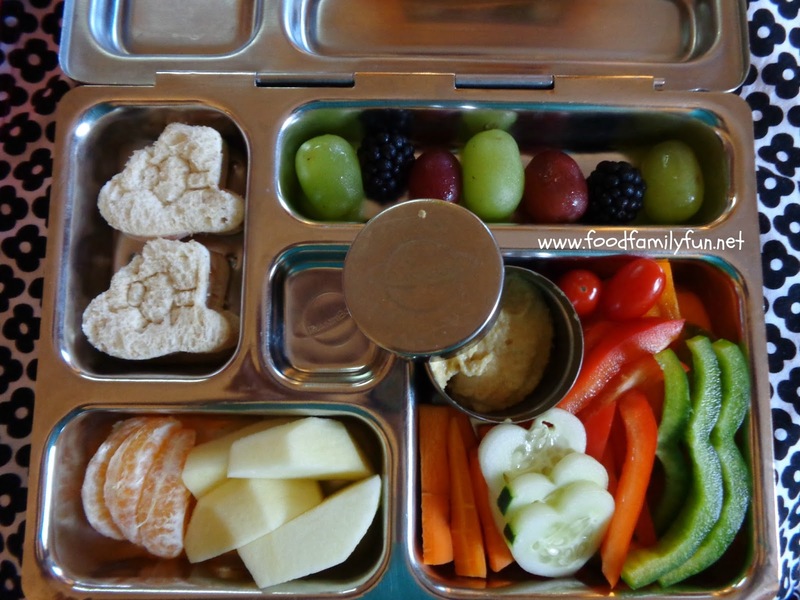 It's best to choose the size container by your child's appetite and food needs. The Launch has 3 different sized compartments, is the deepest and best for large appetites, used most often by my husband, although I reckon it's great for athletic teenage boys. The Rover has 5 different sized compartments and is good for children around age 5 and up, although my children have used this since age 3, just not filled to its maximum. I have also used this many times for my lunch. It really can hold quite a bit of food. A sandwich or small salad can be packed in the square spot. The Shuttle has 2 compartments, it is good for younger children, snacks, or small appetites. This is the newest Planetbox and I used it extensively for my 2 year old last year. Yet, my 8 year old also prefers this one as she does not eat very much. Another family favourite, made up of a case and an insert. The case lid seals each compartment so you can pack yogurt, applesauce or similar in any spot and it won't leak into the next one even if it's tossed around. Easy to clean but takes a bit longer to dry as the tray insert has a channel on the underside that can be tricky (no dishwasher here!). I do believe that there has been an upgrade and this has been partly solved with a solid bottom on the new inserts. Original Yumbox has small 6 compartments, best for non sandwich lunches with lots of variety. Although I have been known to fit some mini sandwiches in there. 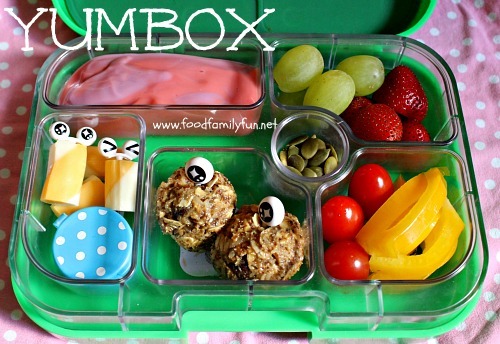 There's a new kid on the block from the Yumbox brand. The Yumbox Panino - this one has 1 larger compartment that will definitely hold a full sized sandwich plus 3 small compartments. I have one on order - can't wait to try it out! Used most often by my 8 year old and husband, or the whole family on a picnic. Easy to remove lids, not leakproof by design. They have mini dipper containers that can fit inside if you want to pack some dip or dressing. There are two colour sets - classic and brights, each lunchbox has 1 large compartment & 2 smaller ones. outings where you might have to eat your lunch on your lap or on the move. great for hot lunch day at school, ours bring their own container and the caterer fills it up. The volume that can be packed is significant, so you would just not fill them up for the younger set. 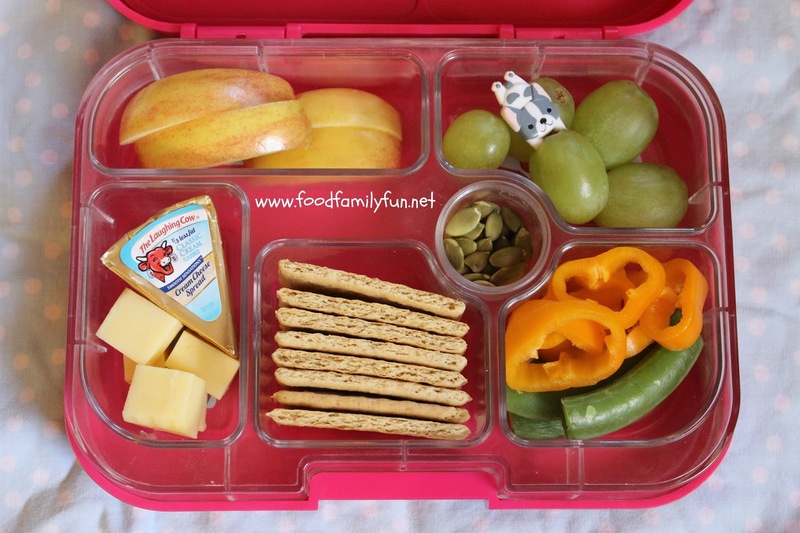 This is a great option for families that pack lunches ahead of time. You would only have a small upfront investment as packing ahead does require you to keep a larger quantitiy of containers on hand. 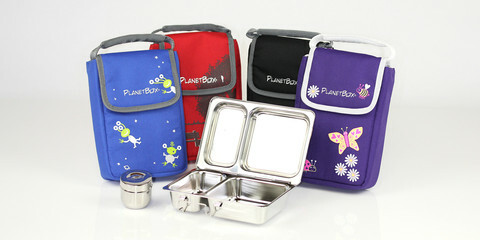 This fits all of our planetboxes, one small snack container, cutlery, ice pack, cloth napkin & a drink on the outside. Hands down our favourite lunch bag. The girls need easy access to their drink for gym days so I love that it's on the outside and they don't have to unpack their lunch to find it. My top tip - the aqua and pink colours dont't seem to stay as clean. In my experience, Purple, Red & Navy look great all year long. If you put them in the washer it will void the warranty. I do this anyway and mine look good inside and out. I have melted one in the dryer because it wasn't set to low heat. Wash & Dry at your own risk! It can also hold the Yumbox and Easylunchbox if your ice pack isn't too big. I recommend buying the complete set Planetbox Rover with the carry bag, if you want only the carry bag you will have to shop directly at the Planetbox Website. On Amazon you can have free Prime shipping so that is where you can find a small savings. This can fit up to 3 Easylunchboxes if you're going out for a picnic, or on a school day - 1 easylunchbox, ice pack, drink, napkin and a couple of snacks. 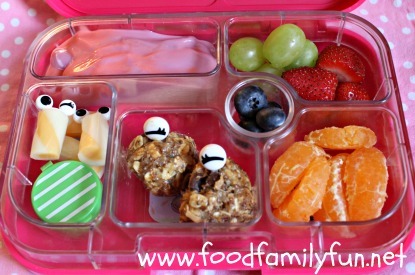 We love it for days when the girls have after school activities at school and need an extra snack. The Planetbox Shuttle or the Yumbox can also fit in this carry bag with plenty of room for extras. They come in 7 solid colours. Here are some tips for DIY personalisation. We also have a couple of the usual sized, rectangular print or character lunch bags. I consider these more of a luxury item. Every other Friday is pizza day and the girls just bring snack, drink, napkin & a plate. While we can certainly use our usual bags, I like to make it more fun with a Friday fun lunchbag. In my experience, there isn't a lot of room in these lunchbags. If your child carries their drink seperately it could work as a regular option with a full lunch. Ours don't actually take a backpack to school yet so that would just be a nuisance. 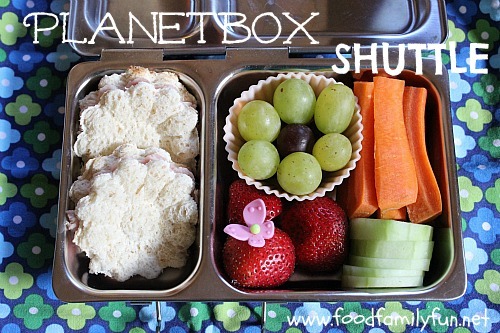 You can fit Planetbox Shuttle, or Lunchbots and many other smaller divided containers and a small snack. With a Yumbox or EasyLunchbox there wouldn't be room for much else, perhaps a napkin, super slim ice pack & cutlery. 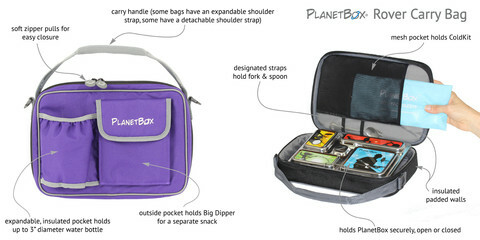 Planetbox come with their own - perfect for use in the outside spot of the carry bag. They don't snap shut so they should only be used in the planetbox or in the outside compartment of the bag, not loose in another bag for instance. 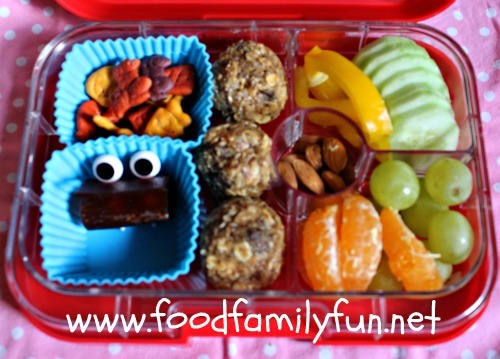 There are LOADS of fun choices if you are sending a small snack. These are my favourites. 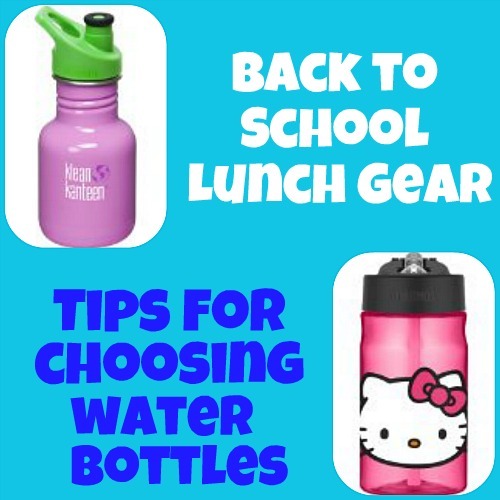 Yesterday, I posted my Top Tips for Choosing Water Bottles. Click here if you missed it. Water bottles - truly my nemesis! I am always on the hunt for the perfect water bottle. Seriously. Always Looking. Summer vacation is nearly over and it's time to get my Back To School Shopping finished. I thought I'd share with you my top tips for choosing a water bottle. Wide mouth opening is best - you really want to be able to fit a bottle brush in there to clean it, plus it's easier to add ice cubes if preferred. Check the cap for odd crevices and parts that come in contact with your drink. In the quest to manufacture the ultimate no spill cup some odd designs have emerged. If it looks too tricky to keep clean skip it. I have encountered some unexpected moldy looking parts of water bottles in my years and now I always check the caps. Take younger children with you when purchasing - make sure that they can open (and close!) it properly on their own. Extra Straws- if you do have water bottles with straws always buy an extra straw kit to keep on hand if available. Cleaning them with Dr Brown's Baby bottle brushes is quite effective. Smell it - I know this sounds weird - but trust trust me, there are some funky smelling water bottles out there. If you encounter a strong smell just don't buy it. Even if it says BPA free, food safe etc some of them just have an odd smell. Leave those ones at the store. Check stainless steel ones too - some of them have a lining. I really want the following features in a water bottle - stainless steel, insulated, no straw, no spill/leak and easy for kids to open and close. I can't always get all of those choices so I compromise. The girls also like fun designs or characters on their water bottles so I get a couple of fun, yet practical ones too. We made it through last year using mainly our Klean Kanteens, but they looked pretty beat up by the end and have been retired. This is not a judgement on the Klean Kanteens. I swear my eldest child lost one twice a week last year but thanks to Mabels Labels it was always returned from wherever she had dropped it. We'll likely go with these choices for this school year. 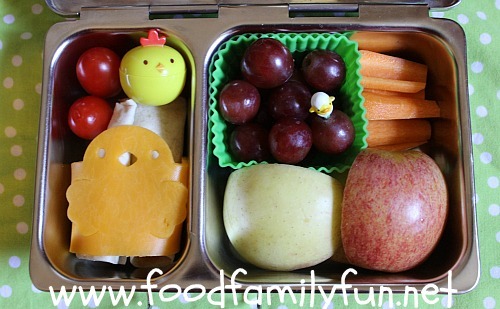 I packed this fun little chicky lunch for Rose to take to camp a couple of weeks ago. Rose has a couple of grape tomatoes, a little surprise treat in the chicky cup, 2 tortilla roll up sandwiches (possibly cheese but I can't remember! ), a little cheese chick wrapped around them. She also has red grapes, carrot sticks and a cut apple - believe it or not those two apple pieces were from the same apple even though the colour is so different. 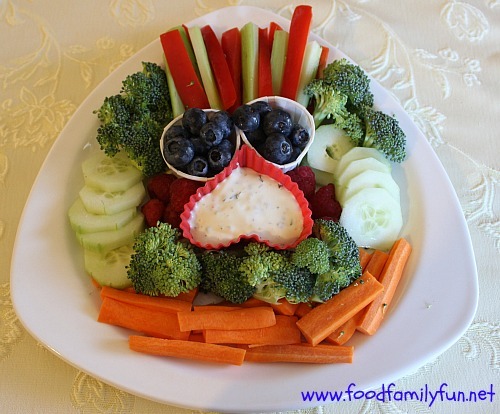 Here's a fun little veggie & fruit plate that I set out during the witching hour at our house. The kids were ravenous and dinner wasn't quite ready so they got to load up on vegggies before the main event. I have posted some other easy dinner side plates before. You can see the rest here. Back to School Blog Hop - and an awesome giveaway! It's back to school time, so the Bento Bloggers and Friends are getting together to share our favourite lunch supplies and we have an awesome giveaway too! Here's an easy vegetarian lunch made using some of my favourite basic tools. Nothing fancy today, just a few fun accents. 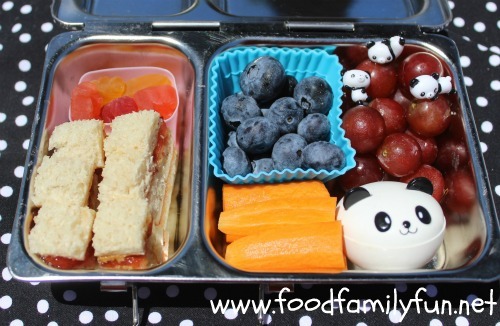 Peanut butter and jelly sandwich bites, fruit snacks, blueberries, red grapes, carrot sticks & a mini panda container of ranch dip. I have 3 favourite lunch boxes in use right now - the original Yumbox, the Planetbox Shuttle, and the Planetbox Rover. New this year is the Yumbox panino, it has a different compartment configuration so it can hold a full sized sandwich or salad. We can't wait to try it! Silicone cups - easy to corral small items, adds a pop of colour. Mini cups - good for dip, sprinkles, or to hold a mini surprise treat. Sandwich cutters - the more the merrier in our house. Here are our faves. Now you can enter to win an awesome prize and grab some fun lunch items for yourself! There are 2 mandatory questions. 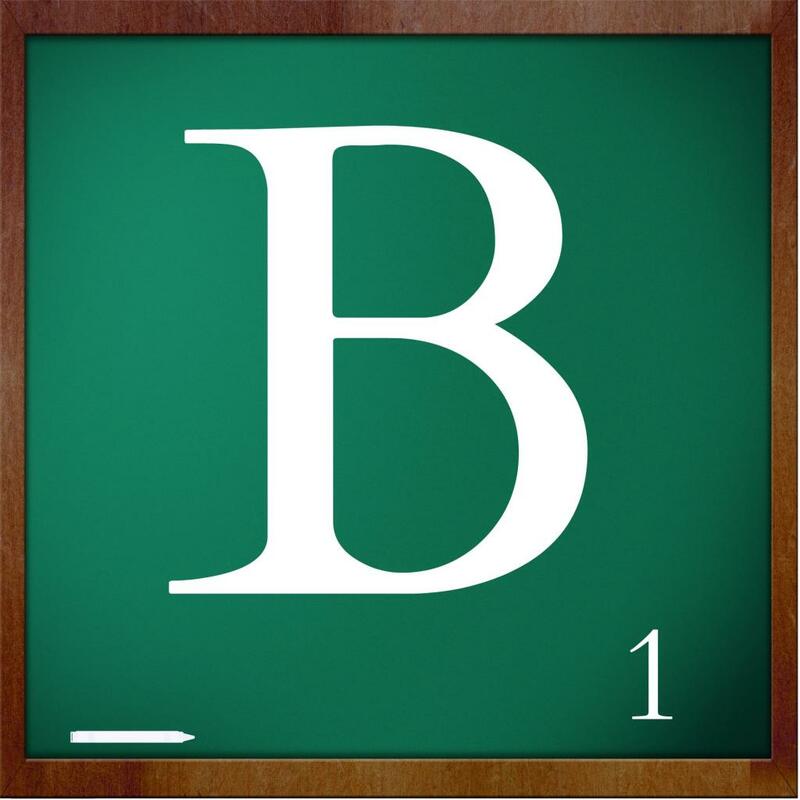 To find the answer you have to hop along to the other blogs and collect the letter tiles. Put them in order and you will find the answer to the first question! The second question is easy - where are you from? 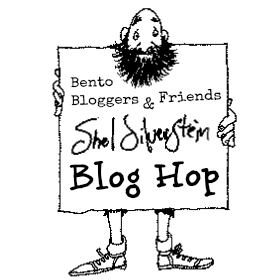 This is to determine which runner up prize you are eligible to win. Here's my letter tile - it's the first letter of the answer :) So write it down and click the button to start hopping - up next is Christine from My Epicurean Adventures. When you have found all of the tiles (there are 16) you will end up back here and you can enter below. By liking our sponsors you can unlock even more entries for the giveaway!